Worldwide icon-chevron-right North America icon-chevron-right United States icon-chevron-right Florida icon-chevron-right Miami icon-chevron-right K Ramen. Burger. Beer. K Ramen’s approach is simple: trendy food served in a cool space. It’s no gimmick (though getting lost trying to find the underground restaurant might lead you to believe for a second that it’s all part of a stunt), rather it’s a refreshing take on food that’s been seemingly done to death these days. You’ve had plenty of burgers, but few quite as juicy or flavorful as their signature sandwich, which is topped with a creamy secret sauce and optional avocado and bacon slices. Make sure you opt for both, plus a side of the duck fat tater tots. 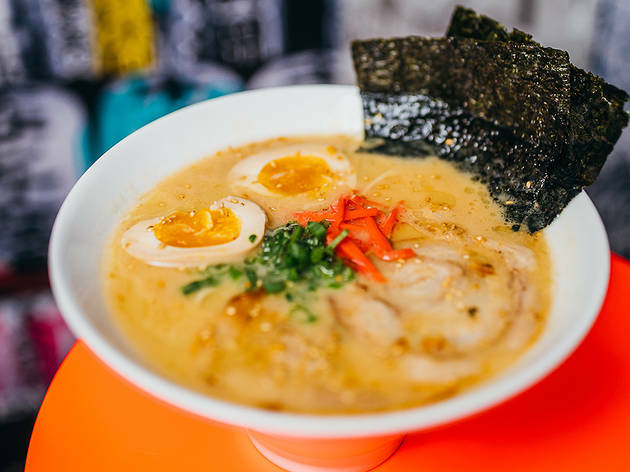 Even ramen, which only makes sense to order two days out of the year in tropical Miami, feels light and new—albeit large and better suited for sharing. Near K Ramen. Burger. Beer.